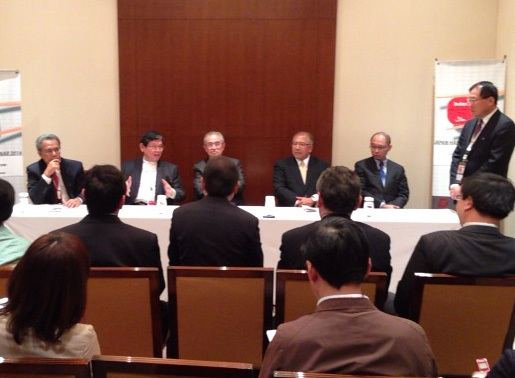 JAPAN HALAL SEMINAR 2014 at CONRAD TOKYO supported by JAKIM,IKIM,and HDC. 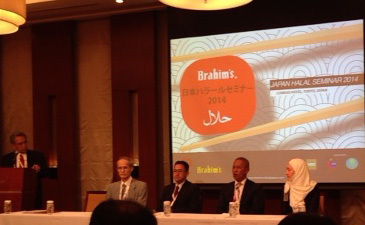 Tokyo, Japan – “JAPAN HALAL SEMINAR 2014” had been organized by Brahim’s Food Japan and Brahim’s Dewina Group of Companies at CONRAD TOKYO Hotel on 2nd June 2014. The Kuala Lumpur-based Brahim’s is a holding company that owns catering services (in-flight meals), food processing plants, restaurants and other businesses. And it was presented by influential speakers from the main organizations involved in halal in Malaysia which includes National Halal Certifying Body (JAKIM), Institude of Islamic Knowledge and Understanding (IKIM), and Malaysian halal Industry Development Corporation (HDC). It offered a valuable opportunity for leaders of three important organizations to convene in one place for the first time in Japan. The seminar opened by Tun Abdullah Haji Ahmad Badawi, former Prime Minister of Malaysia and Former OIC Chairman.He is also known as a person who promote halal as a matter of national policy. 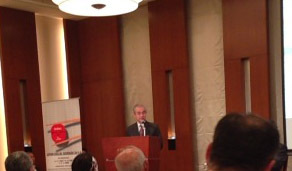 In a press conference, Datuk Ibrahim Bin Haji Ahmad (Executive Chairman of Brahim’s holding Berhad) answered the question about overheating and confusing present situation of halal in Japan.One of objectives of the event is to create the understanding and awareness on the principles and concept of halal in Japan. In the latter half of this siminar, Panel Discussion was held twice.Hind Hitomi Remon (The President of the Japan Halal Association) and Amin K. Tokumasu (The President of the Japan Muslim Association) attended 2nd Panel Discussion as leader of Halal cetification body in Japan, which is recognized by Maraysia.